Within the analysis of how different state health insurance markets will be affected, the report underscores the massive amount of redistribution inherent in Obamacare, especially in the individual insurance market. Their analysis shows a clear shift of costs and taxpayer dollars from certain groups to others. The redistribution comes in two forms. One form is through the insurance regulations that shift costs from once group of people to another. 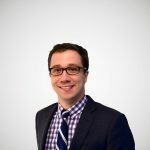 One such regulation is called “community rating.” This regulation essentially prevents insurance companies from experience rating individuals; that is the price of insurance cannot vary among people of varying health statuses within states. So what happens is insurance companies then have to use an average of all individuals in the insurance pool to come up with a price, adjusting only slightly based on age, family size, geography and tobacco use. Those who are healthy will be paying a much higher price than their health status reflects in order to subsidize unhealthy individuals’ access to lower insurance prices. The following chart shows the difference in premiums between two identical people of differing health status under current law in many states and under a simple example of community rating. In the situation before community rating, these two individuals were priced based on the insurance company’s expected pay out. Under community rating, this pricing is prohibited as the insurance company can only price people based on the average. So the premiums for a healthy individual increases in this simple case by 50 percent, while the premium of the unhealthy individual decreases by 25 percent. The chart below from the report illustrates how community rating plus the effects of other Obamacare taxes and regulations such as minimum benefit coverage, guaranteed issue will work out in select states. Healthy, young males in states that currently do not have the Obamacare regulations (Arizona, Florida, Illinois, Ohio, Wisconsin) will see large premium increases the new regulations (some more than 100 percent), while less healthy individuals will see modest reductions in their premiums. New Jersey doesn’t change much because it is one of the few states that implemented these insurance regulations on its own and already had insurance premiums 60 percent higher than the national average. So those below 400 percent FPL will not have to pay the full 50 to 125 percent premium increase while those above this level will pay the full price increase. 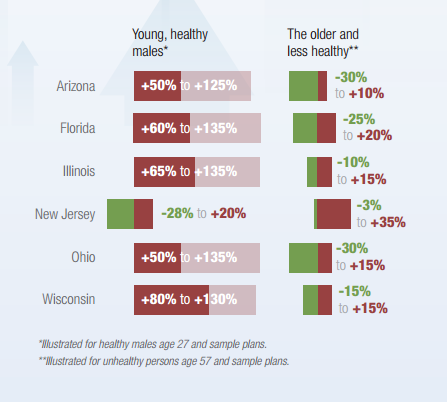 The following chart shows the average rate change for individuals at different income types in Arizona going from a sample plan to a healthcare exchange “silver plan.” According to this analysis, healthy, 27-year-old males who make 140 percent of the FPL will have a rate reduction of 74 percent after subsidy due to Obamacare. Those men making 500 percent of the FPL ($57,450 or more for a household of one) will see their premium increase by more than 116 percent due to not receiving any taxpayer subsidy. Since these subsidies are paid for by tax dollars, those who pay more income taxes will be paying for these health insurance subsidies, while not receiving the benefit from them. This leaves those who pay little to no income taxes to benefit from the subsidy. All this being said, it still doesn’t speak to whether this is the desired result for our health insurance market or not. States throughout the country have used community rating and other regulations, shifting costs from the sick and elderly to the young and healthy. They felt it was fair that sick and elderly people not have to pay far more than younger, healthier people. The subsidies are of course one way to deal with the fact that low-income, healthy individuals will be hit hard by the resulting higher premiums. However, it is still important to realize how much cost-shifting and redistribution there is in Obamacare and this is one way of looking at it.